As of January 1, 2012, Rapid Redux was supposed to have used up his eligibility for the $5,000 starter allowance races. In 2011, Fifteen of his 19 races were run in that condition, which was for horses that “started for a claiming price of $5,000 or less in 2010-2011”. Rapid Redux ran for the $5,000 tag on August 13, 2010, at Monmouth Park. When the year changed, the conditions for the starter allowance switch to have “started for a claiming price of $5,000 or less in 2011-2012”. That switch would make him ineligible. On Wednesday, January 4th, the now six year-old Rapid Redux will go for his 22nd consecutive victory in the 6th race at Laurel. Post time is 2:56 pm ET. The one turn mile starter allowance drew 10 horses but two have already scratched including the eleven year-old Delaware River, a multiple stakes winner of $702,000. Jockey JD Acosta will be riding Rapid Redux for the 6th time in past seven races. A fast track is likely as the weather forecast for race day is for sunny skies and temperatures in the 30’s. AWESOME RHYTHM finished a strong second, a half length behind Rapid Redux in their most recent 13Dec11 mile and a sixteenth race. Before that he finished second in a similar race. His three most recent Beyer Speed Figures (BSF) are: 83, 78, and 75. NINTH CLIENT is the second half of a John Rigaltieri trained entry. The six year-old won $65,189 in 2011 with two wins. His last three races have been in NW1 allowances showing a second and two fourth place finishes. His most recent win was on 17Aug11 at Del. BSF: 80, 78, 77. 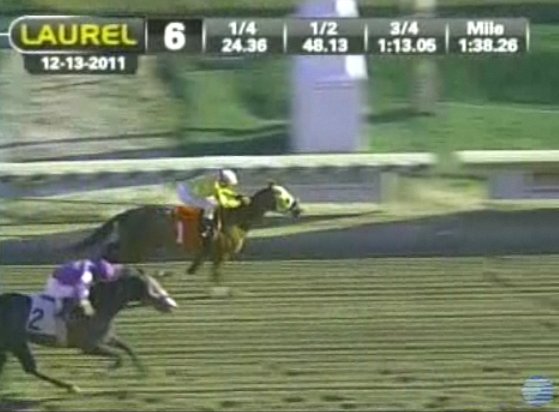 GOLD CASING has won his last two races at Laurel for claiming tags of $7,000 and $4,750 N2Y. His come from behind running style produced 4 wins from 15 starts in 2011. BSF: 77, 76, 60. RAPID REDUX has now won $351,919 in his career of 41 starts with finishes of 27-1-1. In the current 21 race win streak, five of the victories have been at today’s distance of one mile. BSF: 84, 83, 85, 89, 87, 85. GRUNWALD won his most recent race at Laurel on 17Dec11 going seven furlongs in an $8,000 starter allowance. Another off the pace runner, he finished second on 8Dec11 in a mile and a sixteenth $5,000 beaten claiming race. Before that he veered in and lost his rider. BSF: 74, 64, X.
SARGE’S just came back on 2Dec11 from a five month layoff to finish fourth in $5,000 starter allowance. During the summer the five year grey gelding had two second place finishes at Del. He won three out of eight starts in 2011, for $33,570. BSF: 67, 75, 76. WILLIAM’S PRAYER also won his last start at Laurel in a $5,000 claiming race for N2L. He sandwiched a distant seventh place between his maiden claiming $10,500 score and his most recent effort. BSF: 66, 21, 64. WALKIN’ BOSS earned his second career victory at Laurel on 13Dec11 in a $7,500 claimer for N2L at a mile and a sixteenth. Since his maiden win he has been running in the non-winners of two lifetime condition. BSF: 57, 48, 51.